Paper has been made on the banks of the Androscoggin River for over 125 years. Throughout that time and for different owners, the Gorham mill employees have continued to produce superb quality paper products. Through the Great Depression, two World Wars, and many other challenges, we’ve been here. Our commitment to our customers is paramount. Our commitment to each other is like family. We make paper. Paper is what we know, and it’s what we do well. Our At-Home and Away-from-Home towel and tissue products are well known and respected in the industry. That unwavering commitment continues today with our current owner Patriarch Partners. 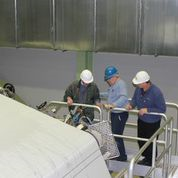 In 2012, Gorham installed a new state-of-the-art crescent former tissue machine, beginning yet another chapter in a rich legacy of papermaking on the banks of the Androscoggin.